To modify an old joke about high dollar purchases, "If you gotta ask, don't." Seriously, don't try to teach yourself acro in an RV. At minimum, get someone who has experience to fly with you, or get instruction from a pro if you can afford it. Doing a loop in an RV is easier and simpler that a lot of other planes, but if you 'fall out' of a maneuver, the plane can overspeed much quicker than more traditional acro a/c. Years ago, a friend tried to teach himself acro in a homebuilt with similar performance and killed himself. Having said that, I'll answer your question. In my fixed pitch 160hp RV-4, I do all the basic variations on loops and rolls starting at cruise power, and rarely if ever touch the throttle during a maneuver, even on the back side of a loop. With a c/s prop, the burden of throttle management is even less. After some basic aerobatic training, your question will be self-evident even if you did not train in an RV. From cruise speed, pull the stick back until only blue is visible outside. Continue to pull until only brown visible, pull some more until the normal attitude is back. Stop pulling. Keeps the wings level. If more detailed instructions are required take some training. Initial speed is not critical, the amount you pull is. Modulating the pull as the picture changes from blue to brown is also important. Best way to find out is get someone to show you. Teaching yourself can be (very) unhealthy. RV acro is not special. Just get some training in a Decathlon and understand the RV is cleaner. I am not telling you HOW to do a loop. As luddite42 said, good advice, get some dual, understand before you start. Second, there are things you should do and think of before looping your RV. You should start at 3000 feet AGL and practice stalls and stall recovery. Stalls (and spins) are always possible with a poorly executed aerobatic maneuver. Consider practicing stalls and doing steep turns to get your feel for stick force and G force. Blue line or maneuvering speed is 134 mph. We are not doing abrupt maneuvers, just be aware. 180 mph is bottom of yellow, or smooth air speed. 210 mph is red line, never exceed. 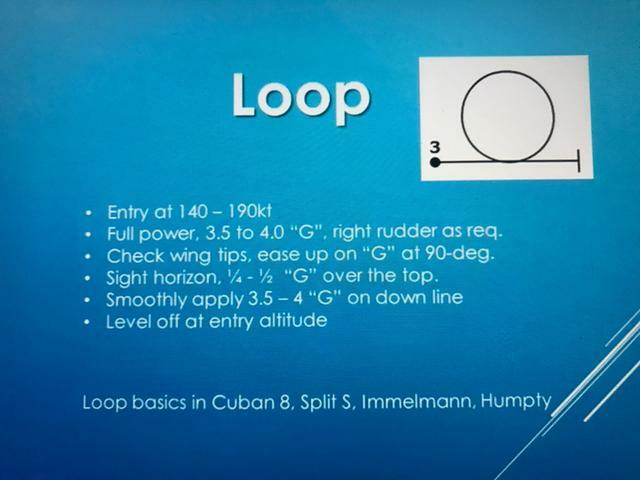 A loop starts in level cruse flight (recommend start at or below yellow line 180 mph); you are +1G (straight and level), force pushing you in seat. Negative G is pulling you our of your seat (which you should not feel in a loop). We consider load factor "G" to be vertical, perpendicular to the wing in any attitude. Initiate a moderate straight and level cruise (under 180 MPH bottom of yellow line) and pull up smoothly to 3G. (2.5-3.5 will work but beginning 3G is about right). Having a G meter helps. There is some significant stick pressure (like in a steep turn), but again don't over load and don't be abrupt. Blue line or maneuvering speed is 134 MPH. Too little pull up you will run out of airspeed before getting over the top. Too much you are needlessly loading the plane and may have excess speed at the bottom of loop. As you go through the loop you will release the back pressure continuously, to make a round loop (not an egg shape). As you reach the top of the loop, inverted 180 degrees from direction started, you have released most or all of the back pressure. At the top of the loop you will be above stall speed, say 70-80 mph (Vs = 59 mph bottom of green) and less than 1G. Anything over 0.0 G is positive. You want to have about +0.5G +/- . You want to keep some positive G. Some folks float over the top, adding some forward stick. Engines and fuel will be OK for a few seconds near zero G, I don't do that. Speed over top should be over stall with margin (and not too fast either). Again look out the wings, and look out top of canopy, to see your position over the ground; did you get off heading (typically you use a road to line up with)? Keep track of your progress through the maneuver and check your speed and attitude is as planned. As you start down the back side you will feel the G forces built (and hear airspeed build) back up. You increase stick back pressure smoothly.... At the bottom you should be a 3G and same speed you started with (180 mph for example) and same altitude (approximately). You may even hit your own wake turbulence. Do not go over 210 Vne ever.... You will also be looking at altitude because you are trying to level off at entry altitude. At the straight down line look out wings and again see your position and heading. Going through loop you see speed slowly decay from 180 to 70 mph for example, then build back on the back side. The initial 3G will go to 0.5 G over the top, back to 3G at bottom... If not doing another loop you release back pressure at the bottom, straight and level, going from 3G to 1G, and that is the end of maneuver. It is way harder to explain than do. I start students doing 3G pull ups and then knocking it off and leveling off. Doing steep turns and getting warmed up for G's is a good start... As was suggested get some aerobatic dual. 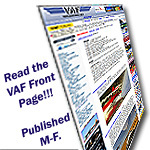 There are great books on aerobatics as well.... RV aerobatics are fun, easy and safe but it is serious business, so have a plan. However I say easy. To do a loop or roll is easy, to do them well, is very difficult and takes real dedication. Last edited by gmcjetpilot : 09-30-2018 at 08:42 PM. Please do not follow this advice. Constantly increasing the pull all the way around with no reference to G is a good way to stall or snap roll off the top unexpectedly.